Jess and Adam from Sheffield arrived at our warehouse to be met by the wonderful Moyra yesterday. 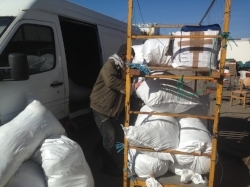 Their mission was to load up their van with bags and bags of sorted donations and deliver them to Calais. We are so grateful to Jess and Adam for this - our own van is truly on its last legs. Happy to add that the donations have now arrived safely in Calais!